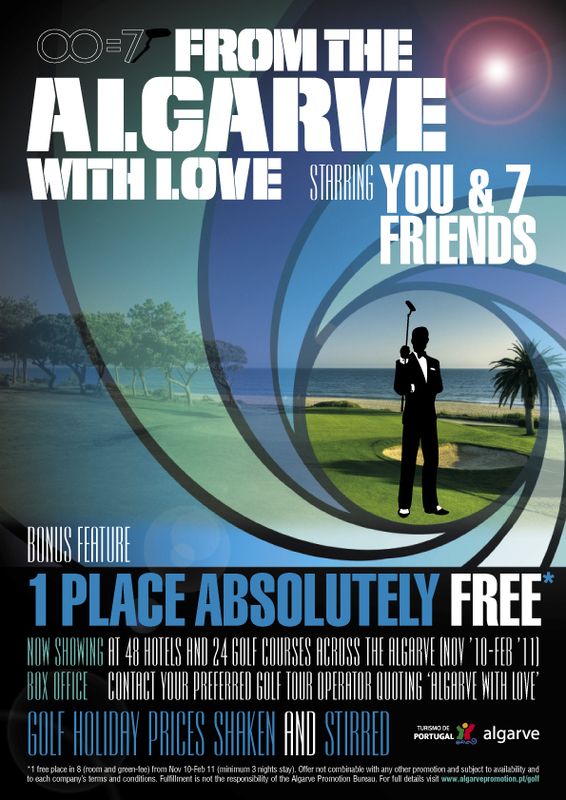 Once again, the Algarve has shaken up the winter 2010/11 golfing scene with its "From the Algarve with Love" promotion, a campaign offering 1 FREE place in every 7 paying golfers - for accommodation AND GOLF! The promotion runs from 1 November 2010 until 28 February 2011 and offers four months of FREE places for golfers looking for some sunshine golf. All you have to do is to find seven friends to travel with and you go FREE, or alternatively you can reduce the cost of each party member so that you all SAVE. One thing for sure is that with an average winter temperature of 18°C, there has never been a better time to experience golf in the Algarve - Europe's Number 1 Golf Destination. 1 free place in 8 (room and green-fee). Valid from November 2010 to February 2011. Accommodation and starting times subject to availability and golf course or Hotel confirmation. The offer is subjected to each individual hotel and golf course terms and conditions for this promotion, details of which are available within the relevant company. A limited number of rooms or green fees may be available at these rates/offer and additional restrictions and blackout dates may apply, this program cannot be combined with any additional discount or promotion. No credits will be granted irrespective of whether or not the full package/stay is consumed.